One of the things that sets Arms of Ilum sabers apart from standard builds sold by places like Ultrasabers and Saberforge is customization. Whether its adding names (in Aurebesh) or factional emblems and accents, the vast majority of my work goes out with some form of custom artwork. When I first started my builds, I used masking vinyl and paints to add personal flair to each hilt. For the most part, the paint worked fine, but it wasn’t as durable as I hoped and in cold weather, wouldn’t stick at all to the aluminum used on most saber hilts. This prompted me to move to powder coat. Some past customization work. This is before I began using powder coat. For those who aren’t aware, powder coat is literally a powdered finish that is blown onto the part by a powder coat gun and compressed air. The static charge applied to the powder as it leaves the gun results in it being attracted to the properly grounded hilt. Once an acceptable amount of powder has been applied, the whole thing is then baked at around 400-degrees Fahrenheit for 10 to 20 minutes. As soon as it has baked and cooled, the saber can be handled immediately and the finish is far, far more durable than paint. As you may have figured, the 400-degree bake cycle presents a problem for my vinyl stencils. As far as I know, there’s only one or two vinyls on the market that can withstand that sort of heat and they’re very expensive. Fortunately, with lots of reading and some experimentation, I’ve come up with a solution. 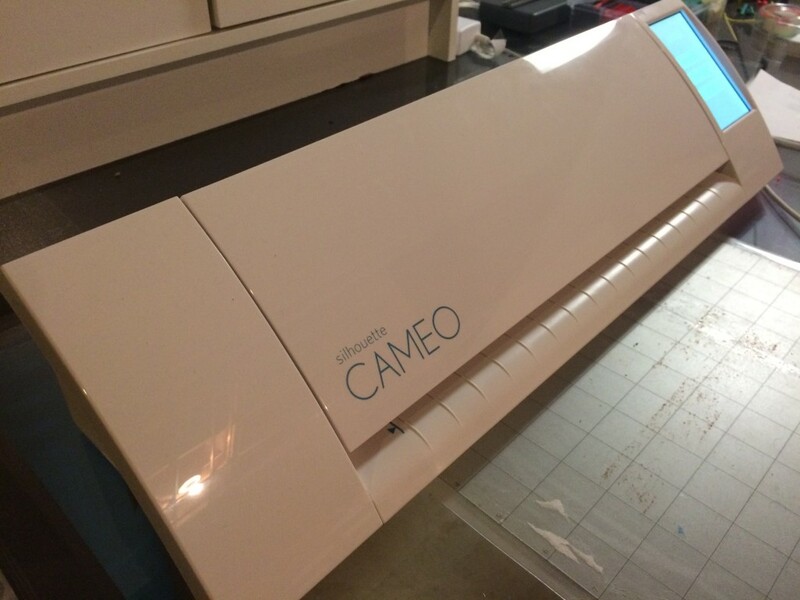 I use a Silhouette Cameo to make my stencils. 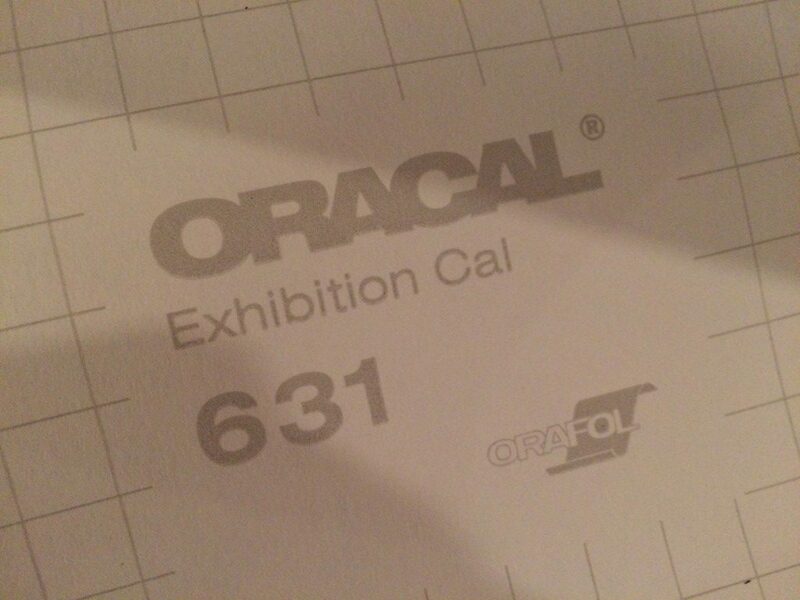 Oracal 631 vinyl is my current choice for stencils. It should be no surprise that the first thing I do with any custom hilt is to create the stencil in the Silhouette Studio software. Silhouette Studio has a trace function that allows it to detect the outline of just about anything. 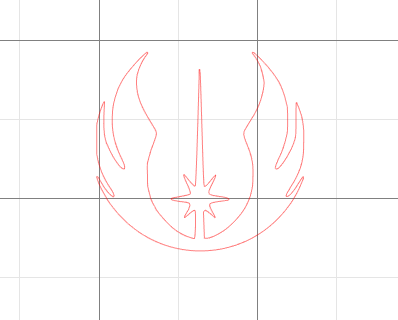 Here, I show a Jedi emblem that was originally captured using the trace tool. With the stencil shapes and lettering created, the next step is to cut it out. On the Cameo, this is easy. I always specify a double cut to make sure the vinyl peels cleanly from its backing. 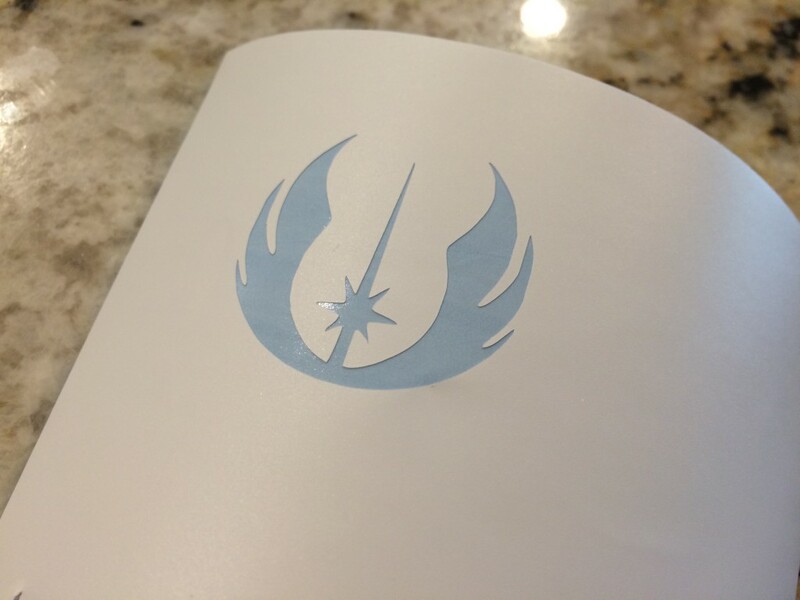 Laying out some vinyl for a Jedi emblem. After the cut. Here, I have removed the positive of the emblem to create a stencil. Once the stencils have been cut, it’s time to remove the excess. 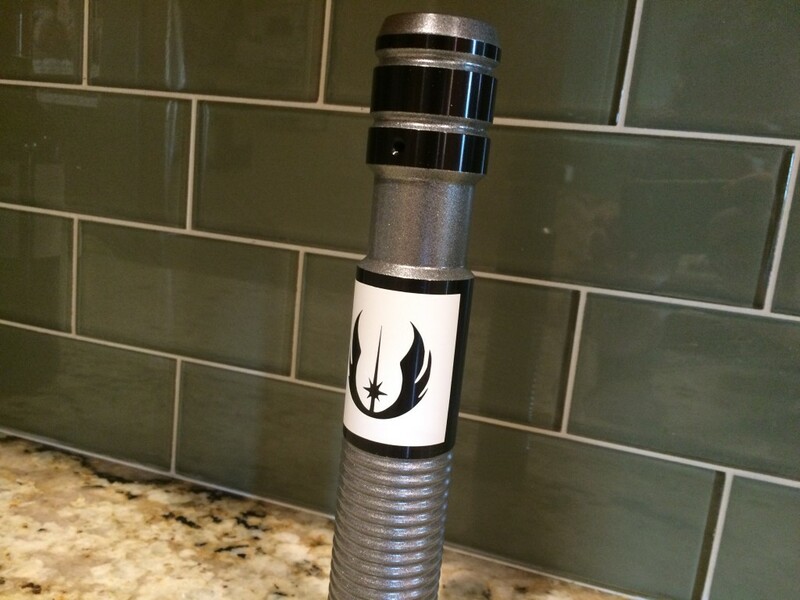 On most of my sabers, I use the negative of the design for my stencils. 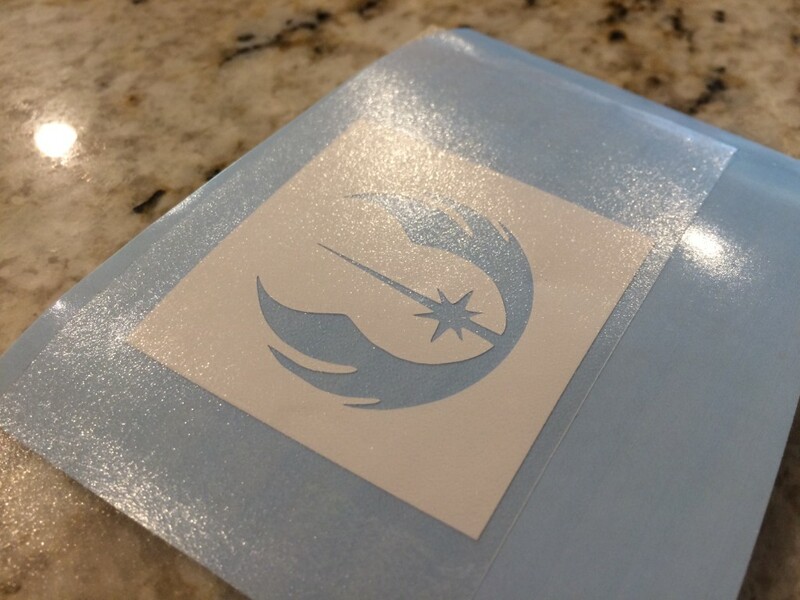 In the case of the Jedi emblem shown here, that means removing and discarding the emblem itself. With the Jedi phoenix popped out, I then trim the remaining vinyl and press low tack transfer tape on top for the move to the saber. Finally, carefully peel the paper backing away from the vinyl at an acute angle and while pressing the vinyl down onto the transfer tape. Find the place on the hilt where you want the design and attach it. 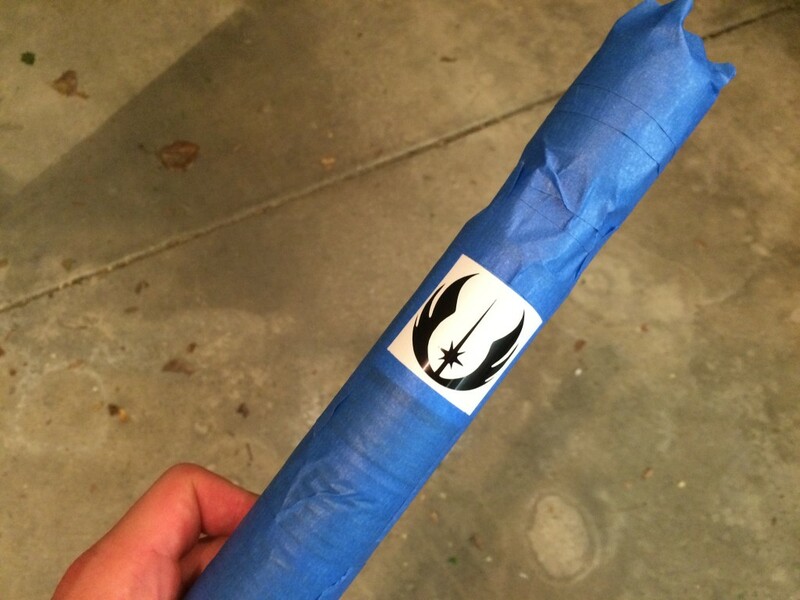 The transfer tape will remove easily once the vinyl is stuck to the saber. Adding the low-tack transfer tape. The vinyl stencil may be in place at this point, but there are a few additional bits of work that are needed. First, we need to tape off the rest of the hilt that we don’t plan to powder coat. For this I use blue painter’s tape. Painter’s tape can withstand the same partial cure temperatures that the vinyl handles and it’s much cheaper than Oracal 631. As soon as I finish taping the hilt, I run the clothes hanger through it for hanging. You may remember that I suggested bending it in a zig-zag pattern. 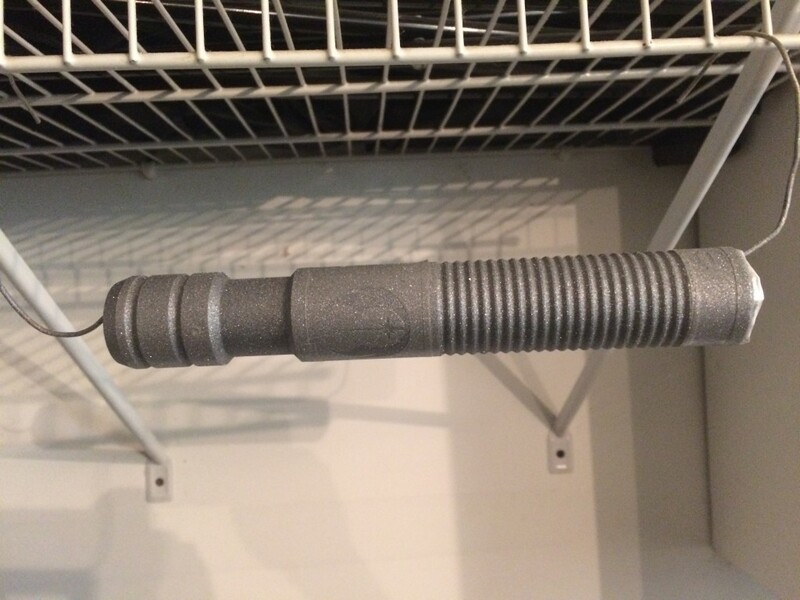 This allows for adequate metal contact between the hanger, the grounding wire, and the saber. 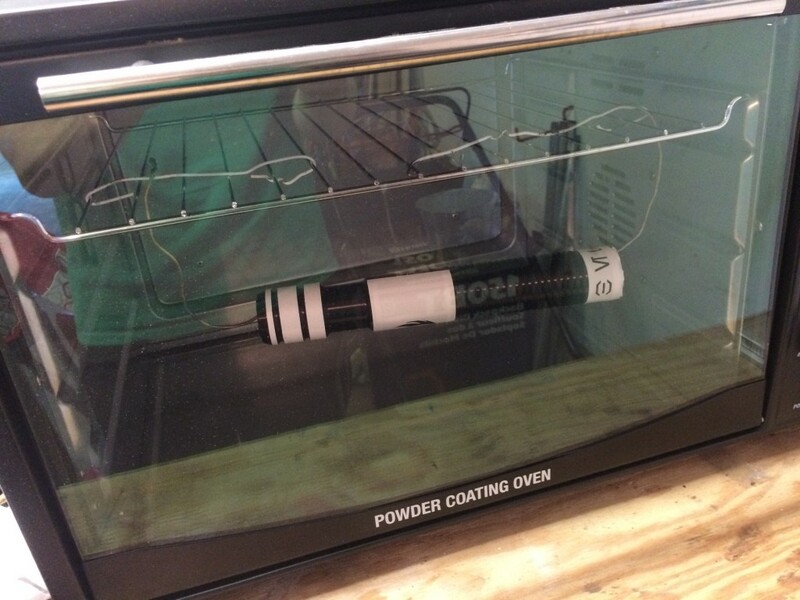 Now, throw it in the oven at 200-degrees Fahrenheit for 10 or 15 minutes to help neutralize any static charge the hilt may have acquired during masking. The saber has now been fully masked. It’s time for powder. With the hilt now ready for powder, I move it to my makeshift cabinet and hook up the grounding wire to the clothes hanger. The next step is to shoot powder onto the hilt. I apply a generous coat to one side of the saber, moving along the length of the hilt. Then, I turn the piece 180-degrees and do more of the same. From there, I immediately move it to the oven for curing. Here, a similar hilt is being warmed before powder. This helps to neutralize any static charge that it may have acquired before or after masking. Remember how I said that the vinyl mask can’t withstand full 400-degree bake temperatures? This is where things get somewhat interesting. Rather than perform a full cure with the vinyl applied, I opt for a partial cure – just enough to get the powder to adhere to the hilt without falling off. Getting the powder to this state requires some trial and error. Generally, 200-degrees for 20 to 25 minutes will be enough for many powders, but some seem to require much more time and/or heat. With Prismatic’s Victory Silver, for example, I often have to bake for 45 to 50 minutes to get any flow out at all. Even then, the powder isn’t durable at all and is prone to chipping. I have tested the Oracal 631 up to 275-degrees and even at 100-degrees past its published limit, it doesn’t melt. You’ll just need to wait for the part to cool all the way before you remove the stencil as it is certain to leave residue when this hot. Regardless, you’ll know the powder is ready once it starts to exhibit a liquid-like sheen. This hilt is at the partial cure/flow out point. It’s ready to have the mask removed. The stage where the powder just starts to liquefy is called “flow out”. 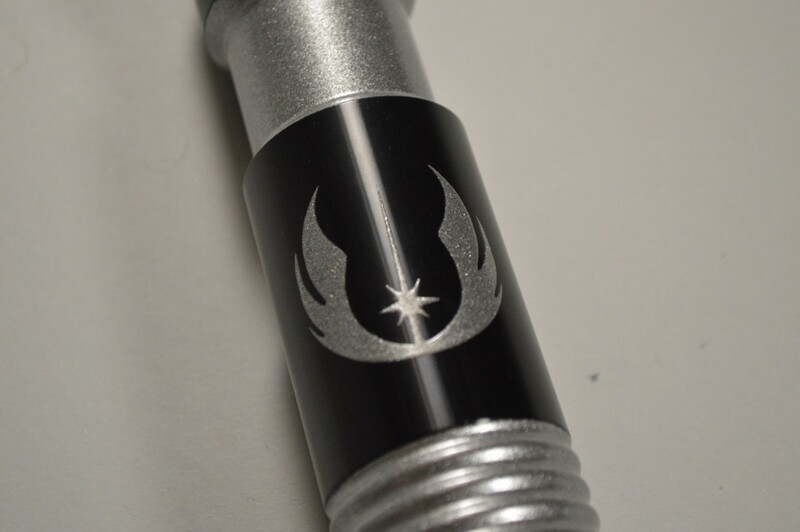 It’s also the ideal time to remove the vinyl stencils as the powder is just starting to adhere to the aluminum hilt. 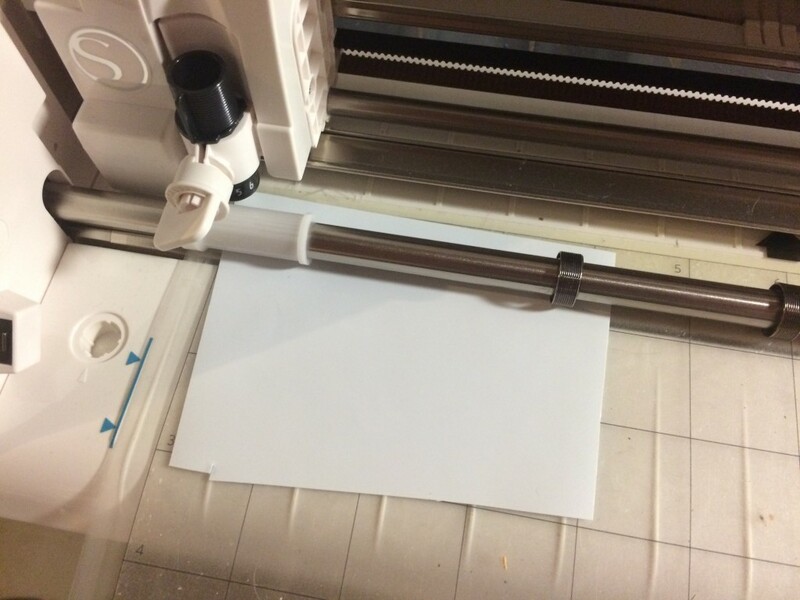 Wait for the piece to cool – too early and you may burn yourself, but I’ve also found that the vinyl adhesive is more likely to be left behind if it is too warm. When you’ve carefully removed all of the vinyl, pop the hilt back into the oven and do a full cure according to the powder’s instructions. It’ll be safe to handle and ready for install as soon as it cools. A look at a finished saber. 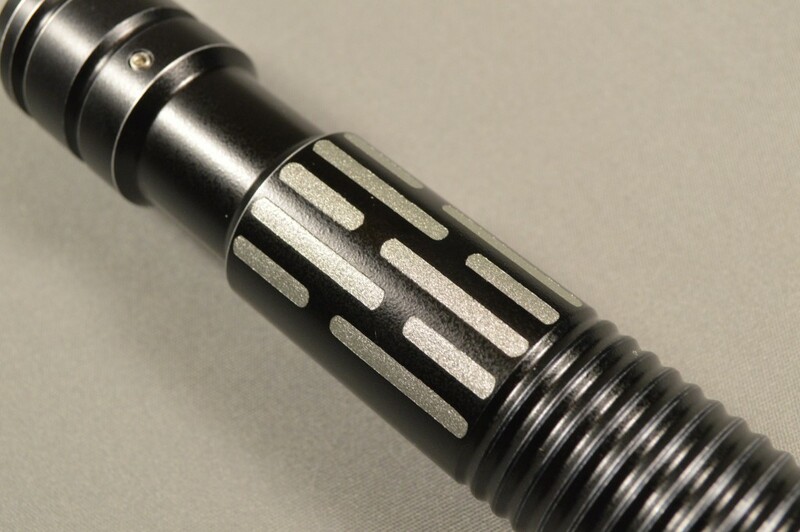 I hope this helps folks who are looking to do their own custom saber work. Obviously, there are some setup costs associated with even a simple powder coat toolset like mine, but everything can pretty easily be acquired for less than $500. To me, getting away from paint was well worth that cost. Nice article. We use Prismatic Powders all the time and have over 50 colors on hand. We find that the powder turns liquid in about 5-7 min after part enters oven. Not 40 min as you have seen. We keep our ovens set to 405 degrees at all times. We have both household and custom made pizza oven. Hey JR, thanks for the comment. The 40 mins is simply because I cannot run the vinyl that hot. Therefore, I have to make it a two step process. The first step is at around 250 degrees for however long it takes for the powder to transition. Then, I pull the part (after some cooling) and remove the vinyl. I then reinsert it for a full ~12 min cure at 400 degrees.